This was NOT the optimal time for my laptop to automatically decide to upgrade itself to Windows 10. Ugh. I’m in a new town with sights to see and explore and no patience for new technology, so pardon the brevity. The front desk attendant, Sharon, here at the Motel 6 in historic Butte, Montana says that “Sparky’s Garage” is the best grub in town and it’s walkable from here, so you know where I’m heading as soon as I click that blue Publish button in the right hand pane. Welcome to day 2! Jason and I pulled off a flawless 714-miler today and enjoyed every minute of it. 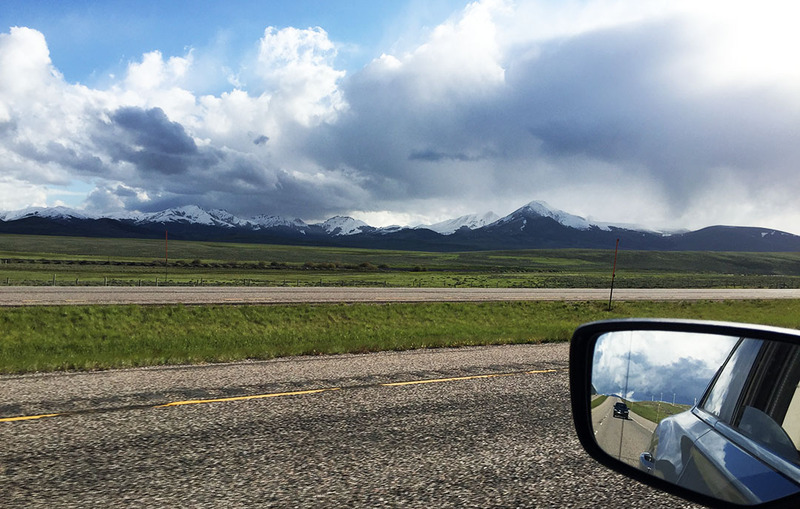 Utah, Idaho, and Montana were BEAUTIFUL. Multiple times on the walkie talkies we agreed – if time allowed, why would anyone fly anywhere? You stare at airports and airplanes and you fight crowds and have to strip down for the TSA. Today, we cruised the open road, listened to whatever the heck we wanted, stopped where we wanted, and kept our shoes on. Plus we saw scenery like this. 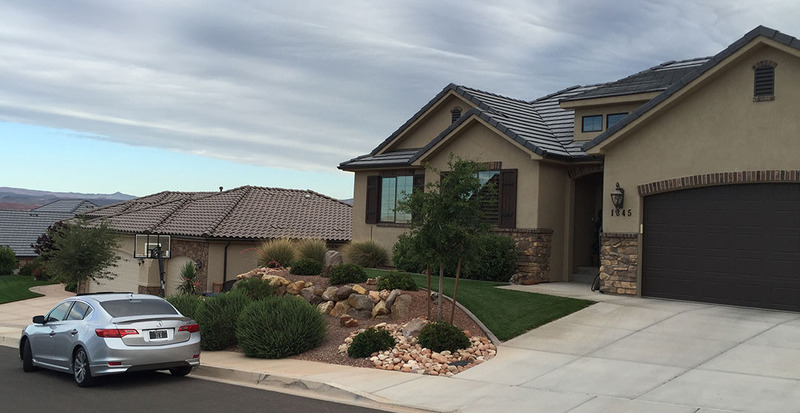 This morning we started out in Washington, Utah at my mom’s place. Over the course of the day, we crossed two state lines, visited with 3 of our friends, and enjoyed some tasty grub. Our route couldn’t have been easier. We spent the whole time on Interstate 15 northbound, which will continue to take us all the way to the Canadian border tomorrow. I’ll let the pictures tell the story for now. Stopping briefly in central Utah in a town called Holden to take a birthday photo for a friend back home who’s from there. Fueling up at Flying J in Nephi, Utah at exit 222. Here, I picked up a dual-outlet power socket thingie. Check out this mess of wires: I can be charging a walkie talkie, charging my phone, and still playing my iPod all at the same time thanks to this setup. The thought crossed my mind. Should I change my car’s clock? I’ve never done that in the 4 years I’ve owned it (Us Arizonans don’t observe Daylight Saving Time). 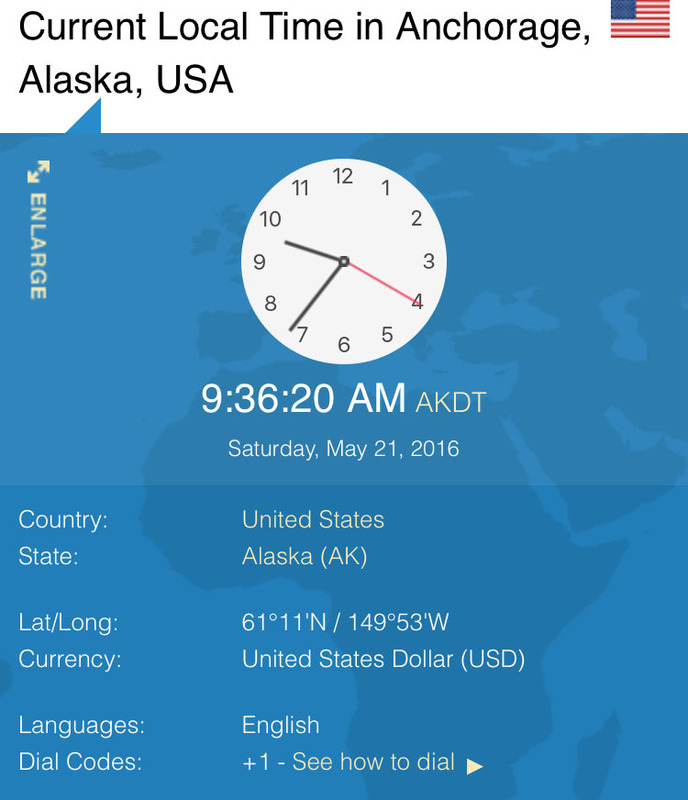 Then I thought… what time zone is Alaska ON, anyway? Turns out, the state has its own time! And it’s an hour “behind” Pacific. 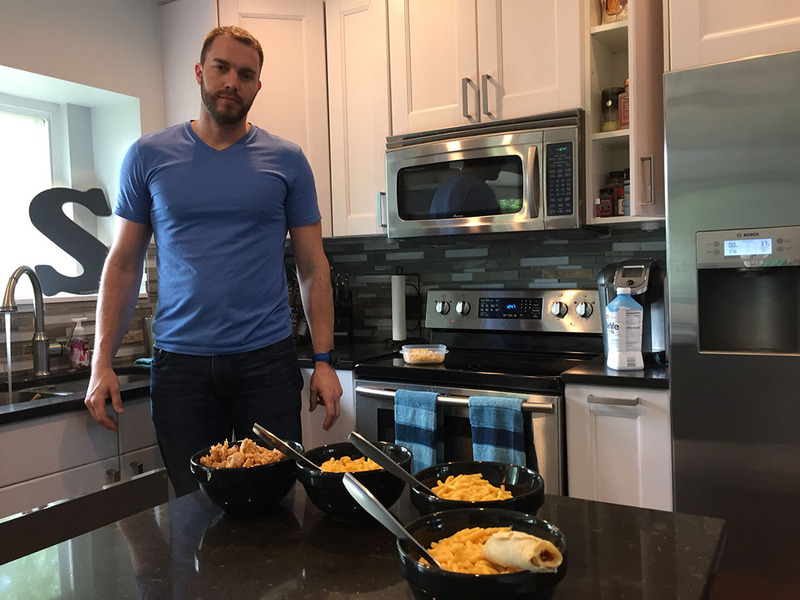 My friend Jeremy made us delicious mac & cheese (plus taquitos) for lunch at his home. Back to the 15 we go. Cruising northbound near central Salt Lake. 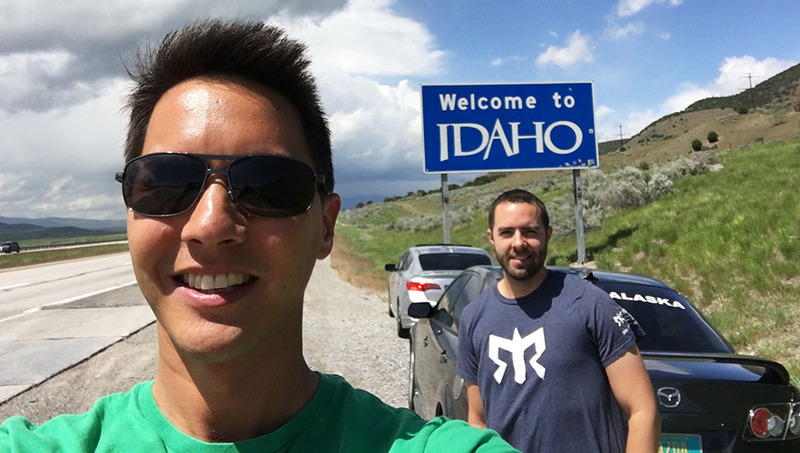 After 400 miles in Utah, we reached the Idaho state line. Potato country! Jason’s Mazda rolled 193,000 miles today. Sign at the gas station in Malad, Idaho. By the way, I’m tracking all my gas consumption and pricing! Full spreadsheet to come when the trip concludes! Nerds get ready. 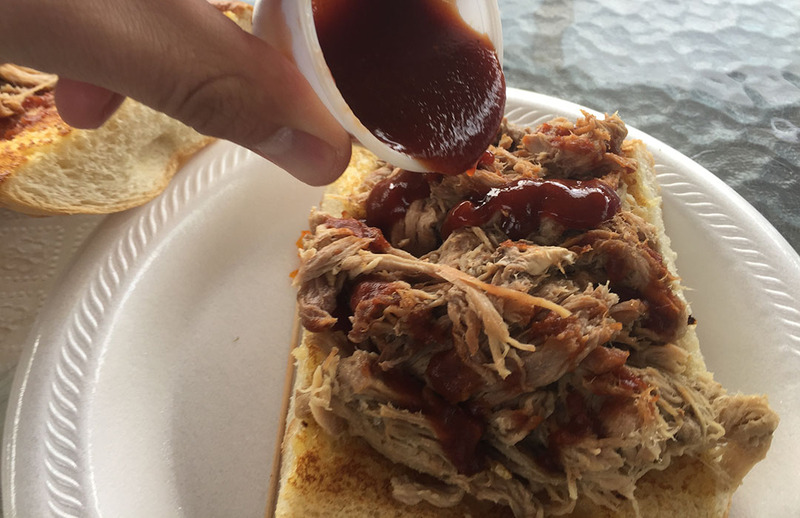 Check out this pulled BBQ pork! I got that from this place right here: Spero’s House of BBQ in Malad. 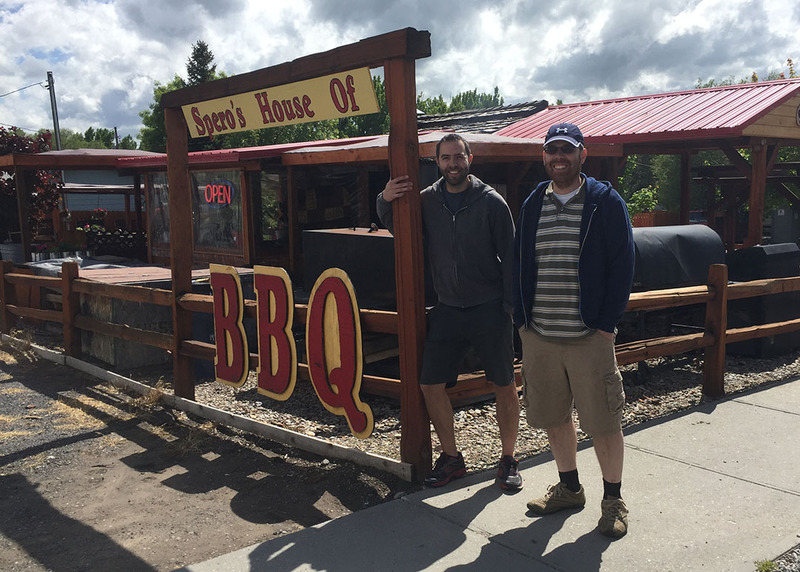 It came highly recommended by Ryan who drove over from Logan, Utah to have a late lunch with us. 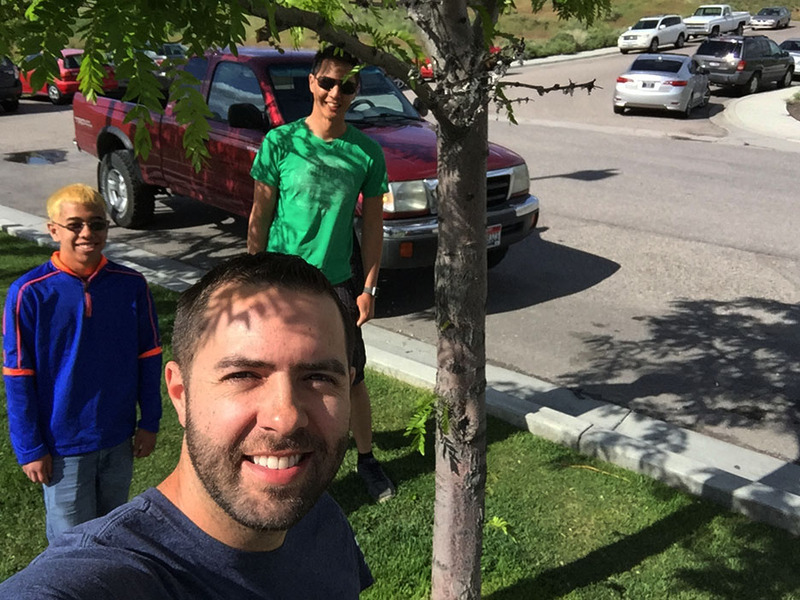 We also met up with my friend and long-time blog follower Nate who lives in Pocatello, Idaho. That’s him in the blue behind me, and his maroon Toyota Tacoma in the background. Thanks for meeting up, Nate! This song felt very fitting. 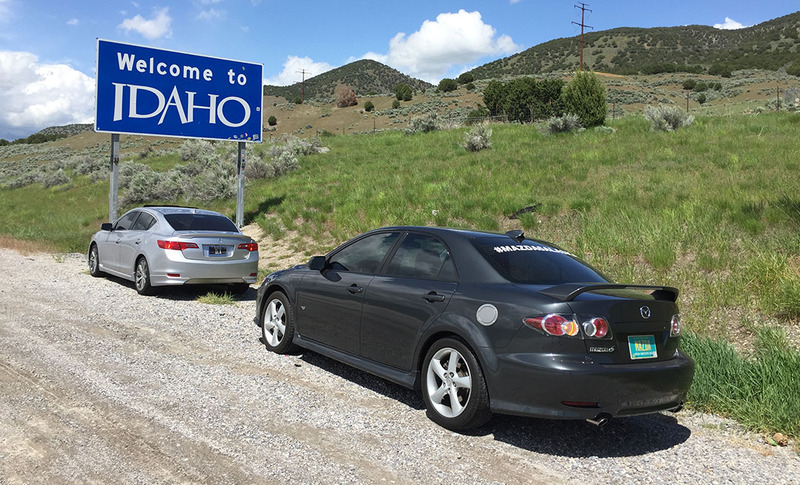 Idaho has “Variable Speed Limits” in some areas. The signs are electronic. Luckily we saw 80’s most of the way. Finally, the Montana State Line! 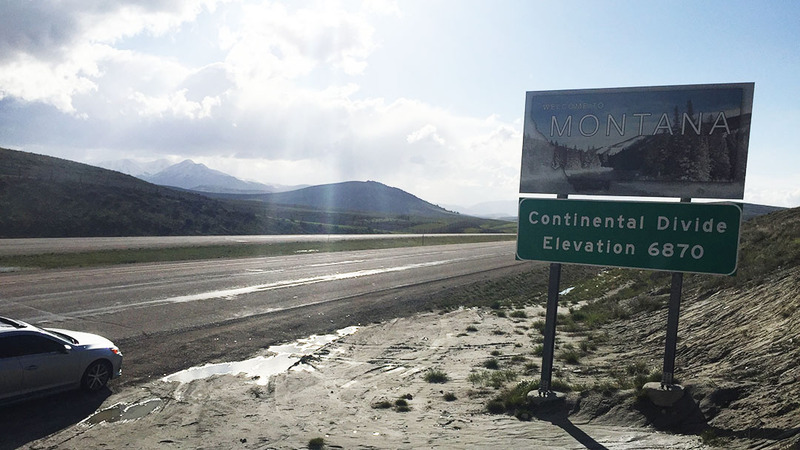 (And Continental Divide) at Modina Pass 6,870 feet. 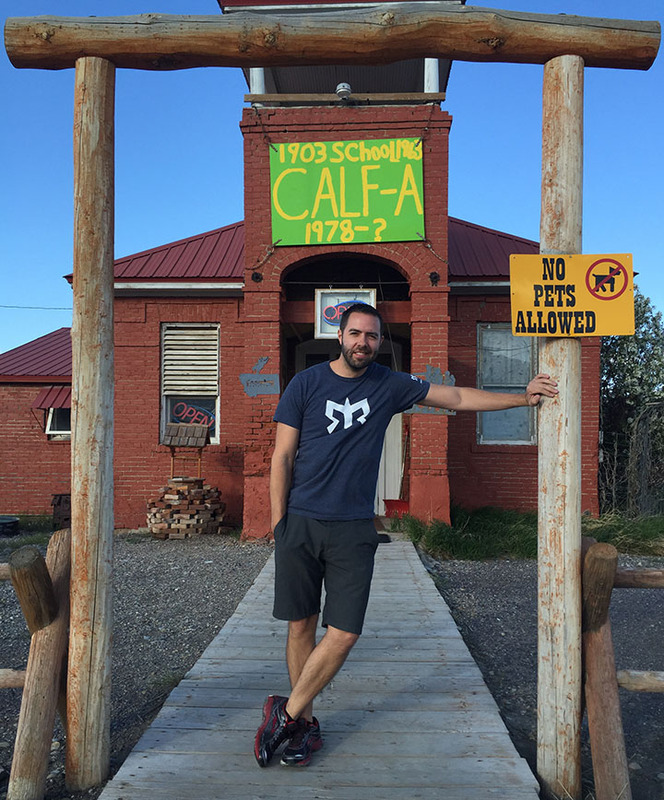 Great little restaurant in Dell, Montana called the “Calf-A.” Dad and I stopped there last July. Downtown Butte is rather charming! Tomorrow: We hit the border crossing into Canada within about 3 hours. Wish us luck. This entry was posted on May 21, 2016 at 8:46 pm and is filed under Alaska, ILX. You can follow any responses to this entry through the RSS 2.0 feed. You can leave a response, or trackback from your own site. Wow. 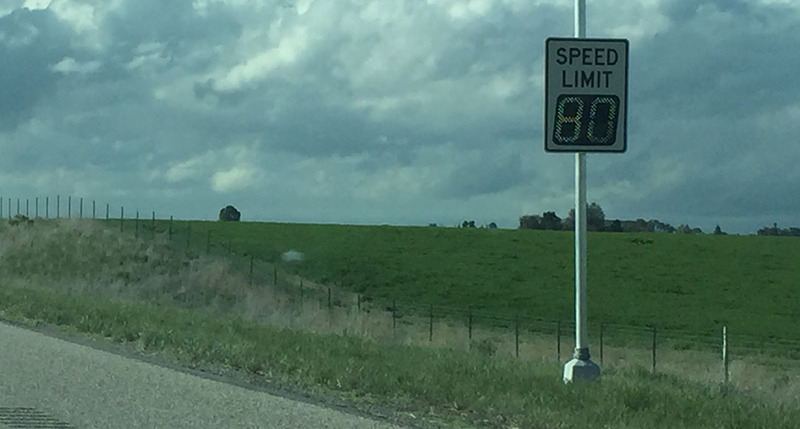 Digital speed limit signs that change to different speeds?? Yes! How advanced right? In rural Idaho of all places. Thanks Carlos! After doing some mapping it’s unfortunate that our route won’t take us there. We are headed north from Calgary instead of west. However, I’m definitely adding this to my list. If there’s time we might be able to catch it on the return leg. So much stuff to see! Me too! Let’s hope they let us hooligans inside! My finance degree is being tested after your day two of driving. First of all, one car has an ILX plate and the other one has a MAZDA plate. Very fishy. Then you drive 714 miles and are stopping all of the time to eat with friends. You two must be driving 85-90 mph when you are on the road. I demand a picture of an odometer while under power. And the road between Banff and Jasper, I’ve bicycle toured that road twice before I was 20 years old. Lake Louise is stunning. With global warming, I’d like to see what the Columbia Icefield/Glacier looks like from the other side of the road. Happy travels Mr. ILX & MAZDA. Okay, I’ll get you a speedometer shot while we’re on the road today! I think limits in Alberta around around 110 kilometers per hour on the road we’ll be on. I’ve been looking at sights to see in Alberta and Lake Louise looks stunning. Unfortunately it’s a little bit west of where we’ll be today. We have friends to see in Calgary and in Edmonton. Have a great Sunday! 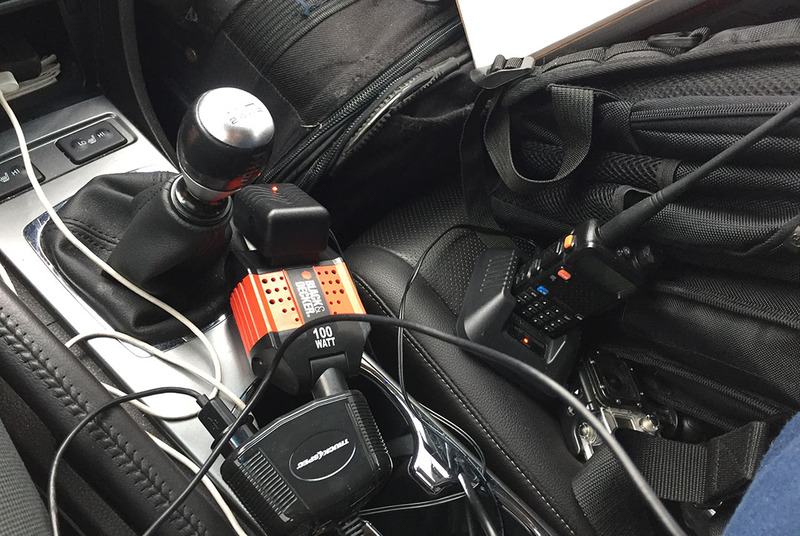 I see lots of tech and laptop bags in the front seat. We need to see how many tires and duffel bags in the back seat and trunk. I prefer to have a mostly empty seat up front in case of emergency breaking. Well, the front seat was jam packed because all the way from Phoenix to Salt Lake, I was hauling 4 Acura A-Spec wheels/tires for my friend Jeremy. I dropped them off yesterday which lightened the load a lot. I don’t mind having all the stuff in the front seat within easy reach. Maps, food, phone, walkie talkie. Gonna leave the back seat fairly clear in case I need to sleep back there! And the 3 spares are in the trunk. Car handles better actually with so much weight in it. More planted! I know you well enough to know your OCD is off the charts with all those wires. Drive safe! I know! I’m dealing with it though. Aloha from Alberta!